The tangy sweetness of orange, kissed by just the right amount of Swiss or dark chocolate. Dorothy's Candies orange slices feature real bits of fruit -- stunning. Be sure to include these for parties, hostess gifts, or sharing at the office. You'll never find these at a drug store! Real fruit. Real Chocolates. For Real people -- just like you! 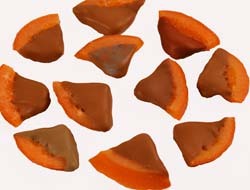 Chocolate Covered Orange Peels – Orange lovers rejoice!